Kuntals Art works is one of the best centers focussing on Creativity in Acryllic paitings. 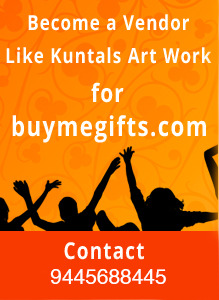 Kuntals Art works run under the Guidance of its Founder Mrs.Kuntal Kumar. Painting lessons are really about seeing. An artist sees by Observing the relationships of color, value, shape and Texture. Once you know how to see these relationships More clearly your painting will be valuable. Mrs.Kuntal Kumar is a professional artist and she taught drawing and Painting for many years and she offer Classes for Glass Paintings and Making Trays, Lamps, Table Tops.